The scope of this paper is to advance the investigation into the importance of introducing uncertainty in service network design (SND) formulations by examining the uncertainty of travel times, a phenomenon that has been little studied up to now. 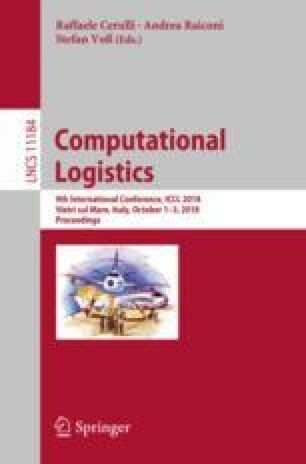 The topic of our research thus is the stochastic scheduled service network design problem with service-quality targets and uncertainty on travel times, an important problem raising in the tactical planning process of consolidation-based freight carriers. Quality-service targets relate to the on-time operation of services and delivery of commodity flows to destinations. The problem is formulated as a two-stage mixed-integer linear stochastic model defined over a space-time network, with service targets modelled through penalties. Its aim is to define a cost-efficient transportation plan such that the chosen quality-service targets are respected as much as possible over time. An extensive experimental campaign is proposed using a large set of random generated instances with the scope of enhancing the understanding of the relations between the characteristics of a service network and its robustness, in terms of respect of the service schedule and delivery due dates, given business-as-usual fluctuations of travel times. Several analyses are reported identifying the features that appear in stochastic solutions to hedge against or, at least, reduce the bad effects of travel time uncertainty on the performance of a service network. Supported by the Ministero dell’Istruzione, dell’Università e della Ricerca (MIUR) of Italy, through its Research Projects of Relevant National Interest (PRIN) program, the Sapienza Università di Roma, Italy, through its Progetto di Ateneo La Sapienza, and the Natural Sciences and Engineering Council of Canada (NSERC), through its Discovery Grant program.